Pöstlingberg was a midday excursion that I took while visiting Linz. Its gorgeous white Basilica that overlooks the city practically invited me up. I also noted all the tourist brochures completed devoted to it, so I figured it had to be nice. It most definitely was! Poestlingburg Castle from the Entranceway It served as an important historical site, a great vantage point for Linz, an amusement center for the family, and a popular local hangout. But, it is a long walk. I actually walked it, thinking that it was ‘just up the hill’ from the downtown (which the tourist map seemed to suggest). It gave me some great, and much needed, exercise (about four miles total, most of its at about a three degree grade). If you are as occasionally mazzo as I am, do it on foot because the scenery is beautiful — you’ll occasionally get a good look over the Danube and the hills are forested and pleasant. Every once in a while, the Basilica (the two-towered object at the rear of the first photo) would appear to me like a beacon, but I admit the Basilica were times that the beacon seemed never to get any closer! 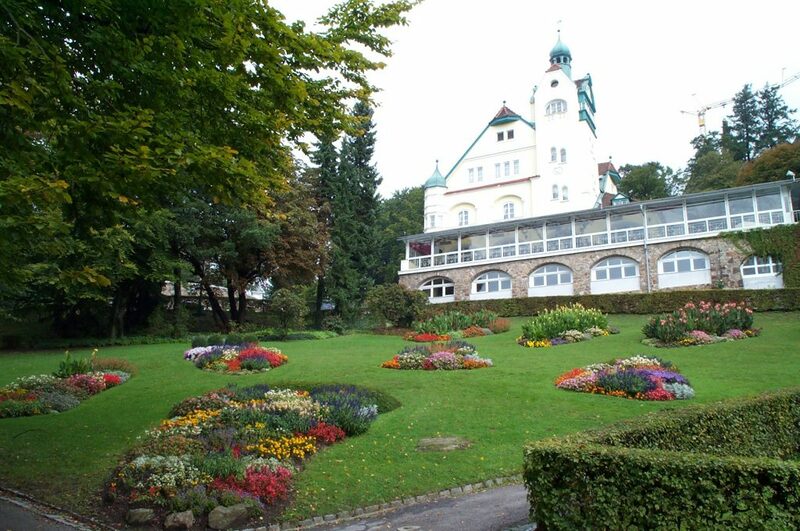 Upon reaching the top of the mountain (apart from catching my breath), I followed the road path past the Pöstlingberg Castle, shown in first photo. (The photo is a little over-exposed, the color of a castle was actually a pleasant cream yellow.) It now serves as a restaurant and biergarten, offering a very nice view of the Danube River and the City of Linz. The clusters of colorful flowers in the garden were indicative of the summer decor throughout the grounds. I continued on seeking the Basilica, which I show in the second photograph. The basilica stood on the highest point of the hill. The exterior was white, while the inside was cream yellow and white trimmed in red marble and the fourteen Stations of the Cross were brilliantly painted in golden frames. The ceiling fresco was wonderful despite it having darkened over time. 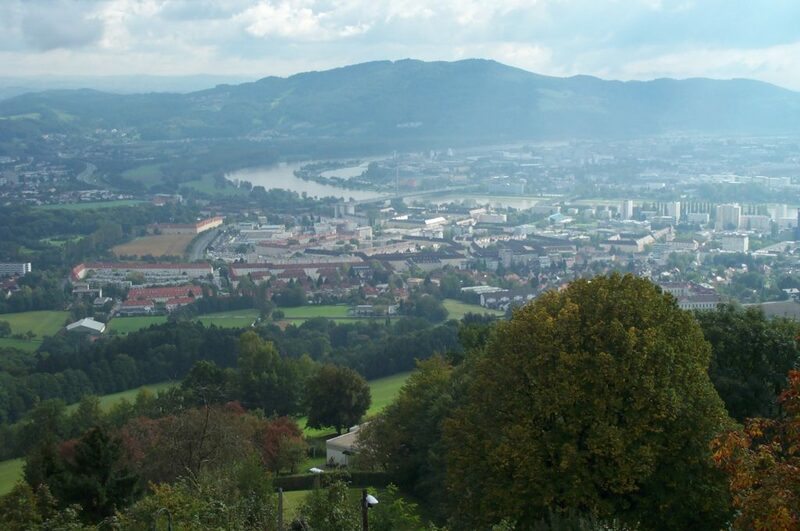 Upon leaving the basilica, I continued the climb until I reached a vantage point that provided a fantastic view of Linz View of Linz and the Danube (third photo above). The asphalted roadways gave way to cobblestone, and I came upon a fork in the road with a steep stone path leading to my left. At the corner was a sculpture of an elf or goblin sitting on top of a stone wall pointing me in another direction without a sign. I thought it was odd, but I decided not to follow it for the time being. Most of the city view was clouded by the heavy industry behind it, unfortunately, but there was no difficulty getting a good shot of the bend in the Danube River. The Grottenbahn was a pleasant surprise. 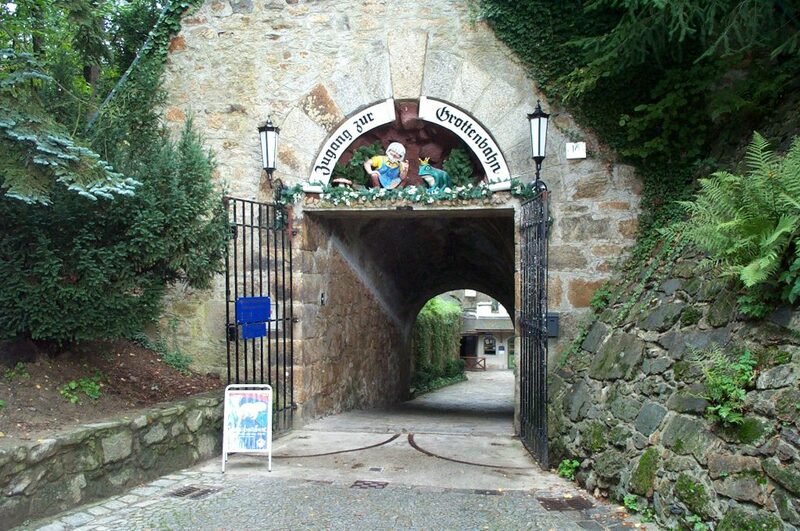 It was a family park that celebrated the fairy tales of the Brothers Grimm( which was interesting as the Grimms hailed from northwest Germany). This attraction was built inside one of the main towers of the old fortress, providing a nice circular structure. There were two levels to it, first being a train ride that passed by dioramas of a number of the Grimm’s stories. The ride was in a darkened cave, with the dioramas brightly lit with colored figurines and lots of music. It might have frightened some younger children, I supposed. Then, the lower level was built as a replica of a town square several meters high with multi-storied building facades, Pöstlingbergbahn storefronts, and corridors that passed for streets. Each ‘street’ was actually a dead end leading to two dioramas depicting the Grimms’ better-known tales: Hansel and Gretel, Snow White, Cinderella, and Red Riding Hood were the ones I recognized (of course all the signs were in German and the tales were given their German names). I treated it like a puzzle trying to figure out which of the tales were being depicted. This concluded the trip, and it was time to get back to the city. Understandably, the thought of a four mile climb down didn’t appeal to me. 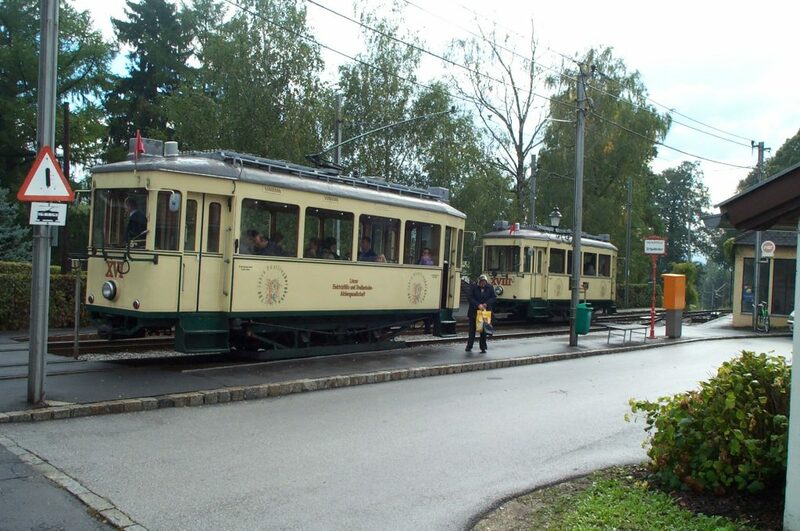 That’s ok — the final picture shows the Pöstlingbergbahn, an old-fashioned electric trolley that gladly made the climb for me. In future, I’ll let it make the climb up for me as well! 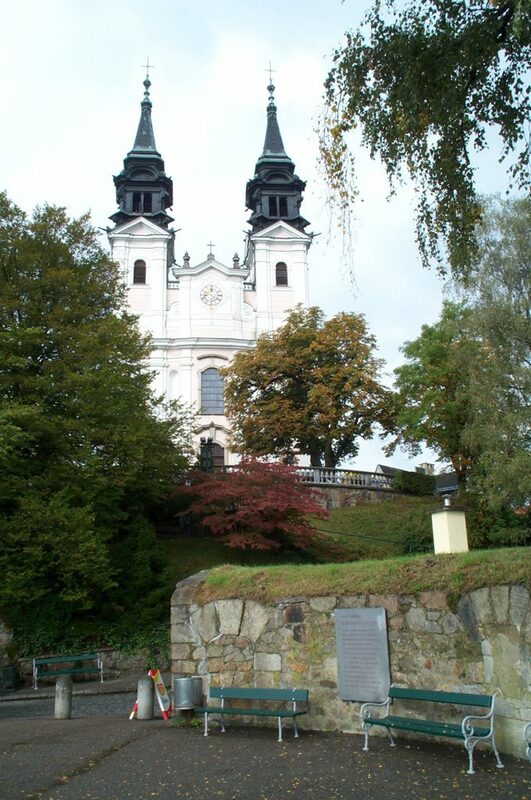 Pöstlingberg was a wonderful excursion, certainly worth a couple hours time for anyone spending a day at Linz!